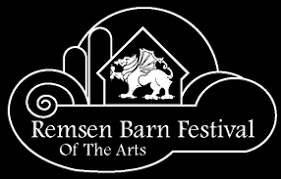 Home Announcement Don’t miss The Remsen Barn Festival of the Arts this year! Don’t miss The Remsen Barn Festival of the Arts this year! When summer fades and fall is in the air… and it is the fourth full weekend in September, then it must be the Remsen Barn Festival of the Arts! You will find fun for the whole family fifteen miles north of Utica just off Rt 12. On Saturday, September 22 from 10-6 and Sunday, September 23 from 10-5, come to play in the street with us. A tradition for 39 years, Main Street is closed to vehicles and transformed into a magical shopping, eating, and entertaining adventure. More than 250 quality crafters offer jewelry, textiles, fashion accessories, woodcrafts, soaps, pottery, holiday items, furniture, glass, candles and more. A variety of food vendors offer everything from hearty meals to sweet snacks. Visit the farmer’s markets for local honey, jams and jellies, gourmet spices and sauces, candy, fudge and local cheese curds, etc. Featured entertainers are Cincinnati Creek, The Old Main, The Magic of Chris Wheel, Harmony Katz, Butler-Sheehan Dance Studio, Kevin Keating, Mike Woolheater and Jim Boccardo. Visit the free quilt show at The Remsen Arts Center or find your way through The Corn Maze Sat. and Sun. from noon to 5 at The Remsen Depot. Visit the free Quilt Show in the Arts Center. Don’t miss the Remsen Volunteer Fire Company’s Pancake Breakfast at the Fire Department on Main Street, Sat. and Sun. morning from, 7 am, until. On Sunday at 2:30 all are welcome to the Gymanfa Ganu (Welsh songfest) in the Stone Church on Prospect St. Admission to the Festival is free and there is plenty of parking. Hot streets and crowds are a dangerous place for animals. Please leave your pet safe at home. For more information visit us at Remsenbarnfestival.org. Next articleZUMBA AT THE UTICA LIBRARY!